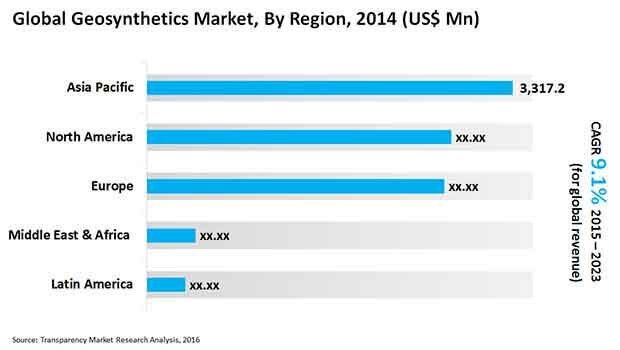 The global geosynthetics market features a fairly fragmented competitive landscape, attributed primarily to the ease of entry of new players in manufacturing a variety of synthetic fibers, finds Transparency Market Research (TMR). Regional players, though, held a sizeable share of the global market, but the top three players accounted for a combined share of 27.7% in 2014. These leading players are Officine Maccaferri S.p.A., GSE Environmental, Inc., and TenCate Geosynthetics. The substantial clout held by these companies was on account of the vast production capacities they had in various key geographic regions. Some of the other prominent players operating in the market are Low & Bonar PLC. and NAUE Gmbh & Co. KG. TMR notes that the proliferation of regional players is what makes the market markedly competition and the intensity of competition likely to continue unabated. The vast potential needs for various types of synthetics makes the market increasingly lucrative for players. The global geosynthetics market is projected to expand at an impressive CAGR of 9.1% in between the forecast period 2015–2023, vis-a-vis revenue. The revenue by 2016 end was estimated at US$11.3 billion, and is prognosticated to reach a worth of US$20.8 billion by the end of the forecast period. Broadly, the various product types are geotextiles, geomembranes, geogrids, and drainage composites. Of these, geotextiles and geogrids are potentially attractive segments, at least till 2023. The segment of geotextiles leads and is forecast to contribute the major share of the overall volume by 2023 end. This is attributed to the extensive uptake of the material in the construction industry. On the geographical front, Asia Pacific, presently holds the sway and is expected to be the major consumer of geosynthetics through the assessment period, and is projected to account for 40.2% of the total global volume by 2023 end. The vast strides being experienced by the construction industry is supporting the rapid growth of the regional market. The constant search for cost-effective solutions and techniques in civil engineering, especially with respect to the raw materials used, is a notable factor driving the market. The drive for innovations in engineering, riding on back of the fast pace of infrastructural developments, taking place in various countries across the globe has led geosynthetics to emerge as lucrative proposition. The growing number of new construction projects in developing economies has catalyzed the demand for geocomposites, geotextiles, and geogrids, in applications such as separation, reinforcement, drainage, barriers, containment and protection, and erosion control. Geosynthetic materials have emerged as a large protective layer for several chemicals used for construction infrastructures on various types of land and soil. Thus they have gained significance in strategies used for containing soil erosion. Thus various geosynthetics material finds usage among farmers for preventing soil erosion. The growing demand for geosynthetics in a variety of construction works bodes well for the market. Furthermore, the attractive demand for geosynthetics as soil binders in wastewater management is boosting the market. However, the noted volatility in raw materials prices owing to fluctuations in crude oil availability and oil and gas prices is hindering the growth of the market. In particular this has affected the pricing of naphtha, which is the key intermediate compound for the production of raw materials used in making geosynthetics. Nevertheless, the market will benefit from new, emerging areas such as for green wall construction. The promising usage of geosynthetics materials in making green roof is creating lucrative avenues for market players. The study presented here is based on a report by Transparency Market Research (TMR) titled “Geosynthetics Market (Product – Geotextiles, Geomembranes, Geogrids, Drainage Composites, and Geosynthetic Clay Liners; Function – Containment, Reinforcement, Filtration and Drainage, and Separation) - Global Industry Analysis, Size, Share, Growth, Trends and Forecast 2015–2023”.